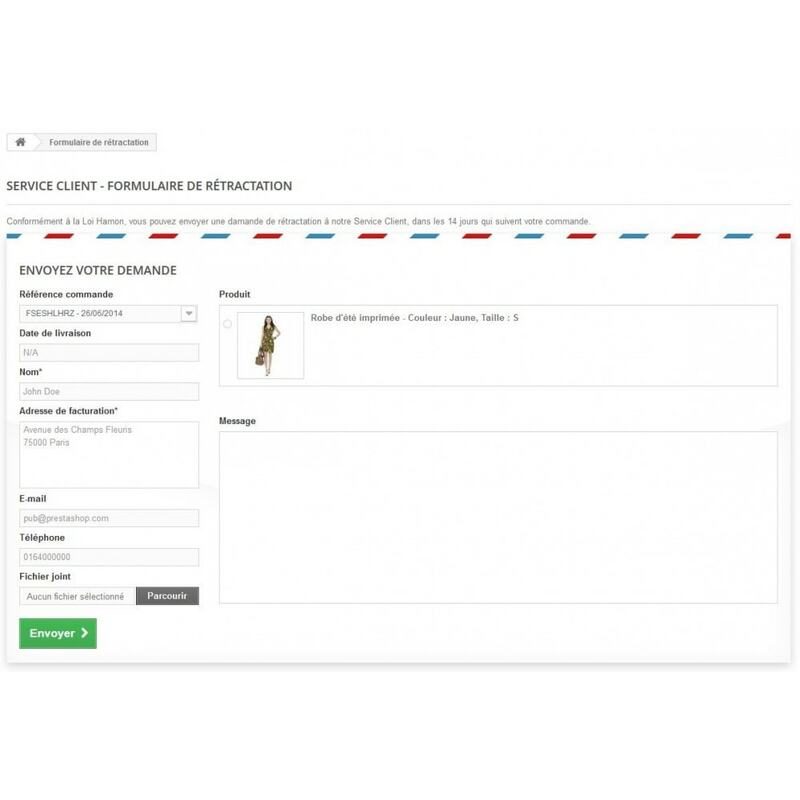 Get in accordance with the law Hamon by proposing a withdrawal form to your customers, and a high-level tracking requests in the "Merchandise Returns" of your shop. 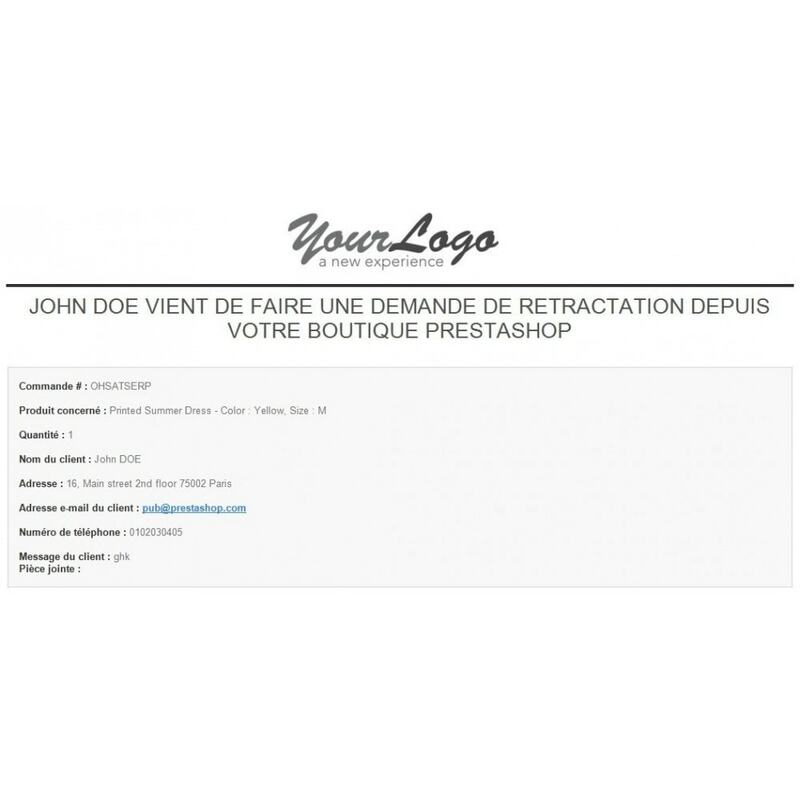 By using the Loi Hamon Prestashop addon, you make sure to comply with the Hamon law, in force since 14 June 2014, thanks to the dedicated withdrawal form and the email confirmation sent to customers. Automatic recording of each requets in the "Merchandise Returns" will ensure an optimal tracking of each requests, with the ability to change their status (accepted, refused ...). The ability to choose the contact address allows you managing requests withdrawal from a dedicated e-mail address. Once a request is made, you will receive an e-mail to this address. In addition, all applications will be archived in the "Customer Service" section of your backoffice. 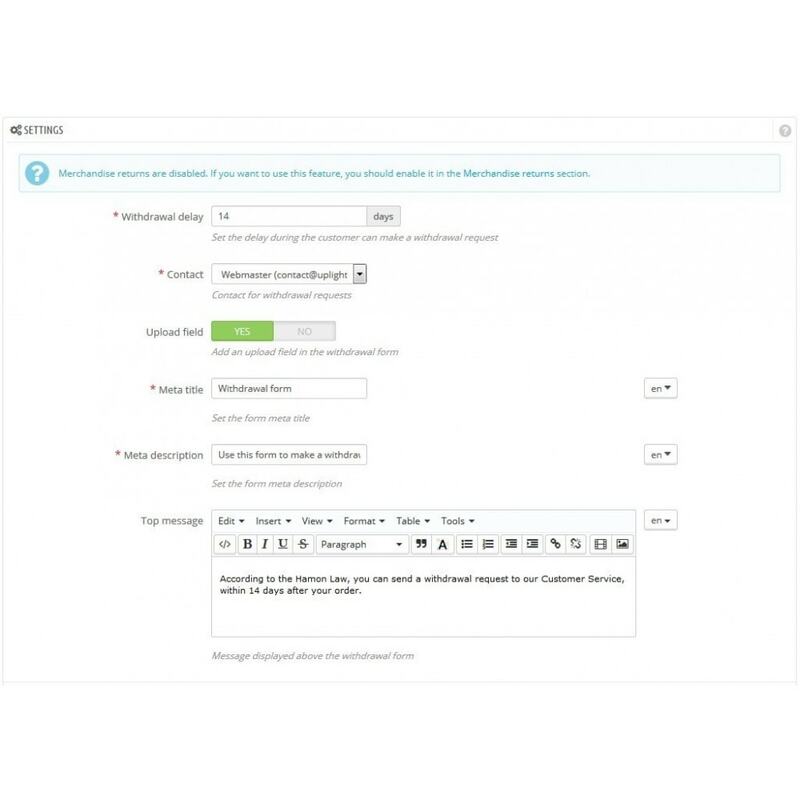 Finally, you have the ability to join a CMS page content in attached file when an order is placed. This PDF file is send to all customers when ordering, in the order confirmation e-mail. This feature allows you to send legal notice to your customers. The PDF file content is generated automatically, so when you'll make changes on your CMS page, the PDF file will always be updated. 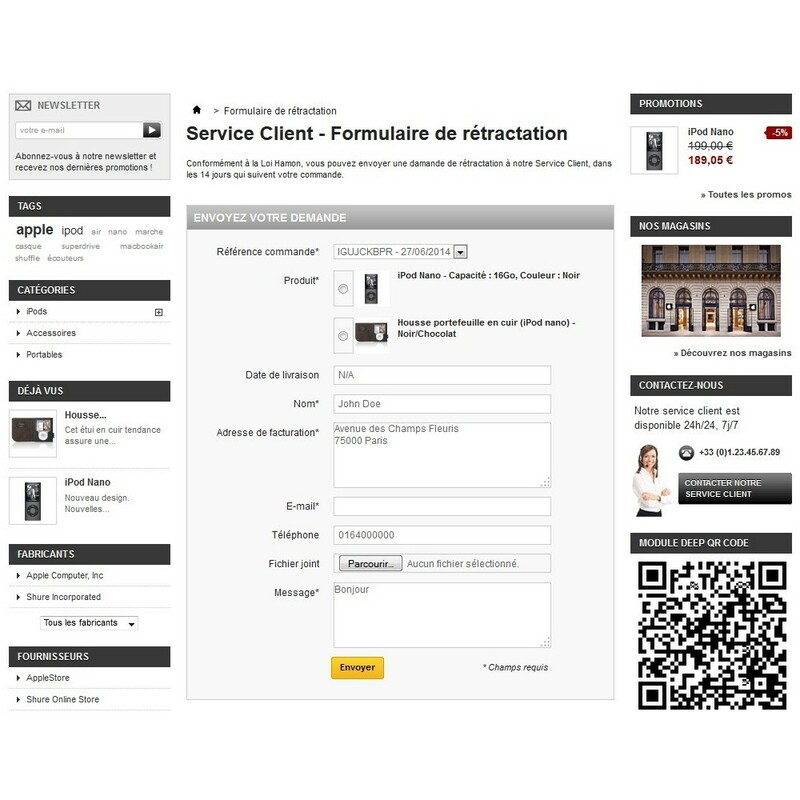 The Loi Hamon Prestashop module uses the Responsive Design technology. So, it fit on smartphones and tablets. The Loi Hamon Prestashop module is W3C compliant. The Loi Hamon Prestashop module is supplied with a full documentation. 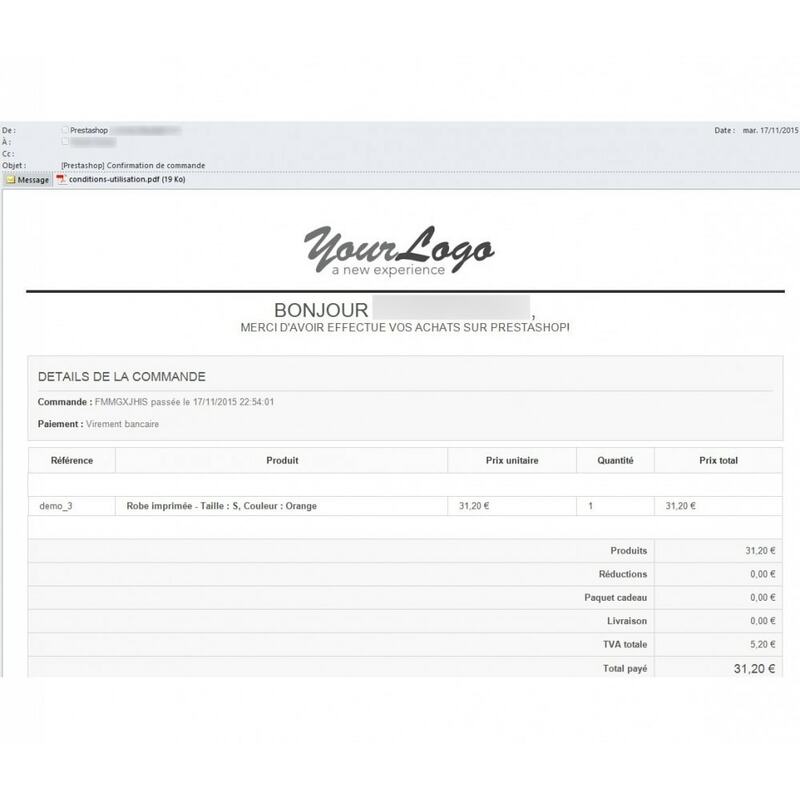 The Loi Hamon Prestashop module allows your customers to access a withdrawal form for orders placed on your shop. Within 14 days, they will have the opportunity to simply retract and receive an email confirmation, according to the Hamon law. Automatic recording of each request in "My merchandise returns" section of the customer area, will allow your customers to have an optimal tracking of their withdrawal requests, with the ability to print their return labels. When they places an order, customers will receive your legal notice. So, they will be informed of your conditions at each time. The Loi Hamon Prestashop module can be installed in the same way that any Prestashop module. Either by uploading directory of the Loi Hamon Prestashop module, via the FTP protocol, in the "module" directory of your installation. Or by using the "Modules" tab of the back office of your shop. For more information, see the documentation provided (readme_en.pdf file). 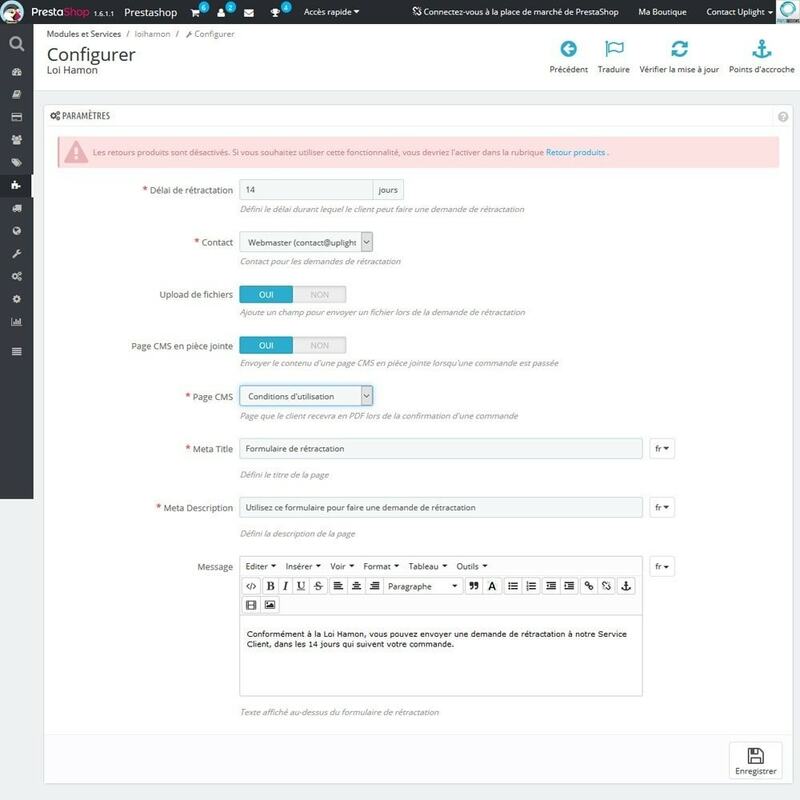 Manage blocked cookies and display a banner on your shop to be in accordance with the EU law about cookies!A real cookies blocker manageable by each of your visitors. Increase the load of your shop and manage easily your website footer with the "Footer Blocks " Prestashop add-on! Manage the content of your website footer using a single module! Boost your marketing operations and increase your conversion rate thanks to the Marketing Popup Prestashop module!